Festival Costume Presentation Show by Dennis Natividad · 365 Project. Misters of the Philippines 2014 Festival Costume Presentation show held at the Activity Center of The Fisher Mall. Mister Samar – Edviro Fuentes Jr.
Mister Tondo Manila – Neil Perez. Winner of Best Festival Costume will be announced on the Finals Night of Misters of Philippines 2014 on September 7, 2014 at the Grand Theater of University of Makati. 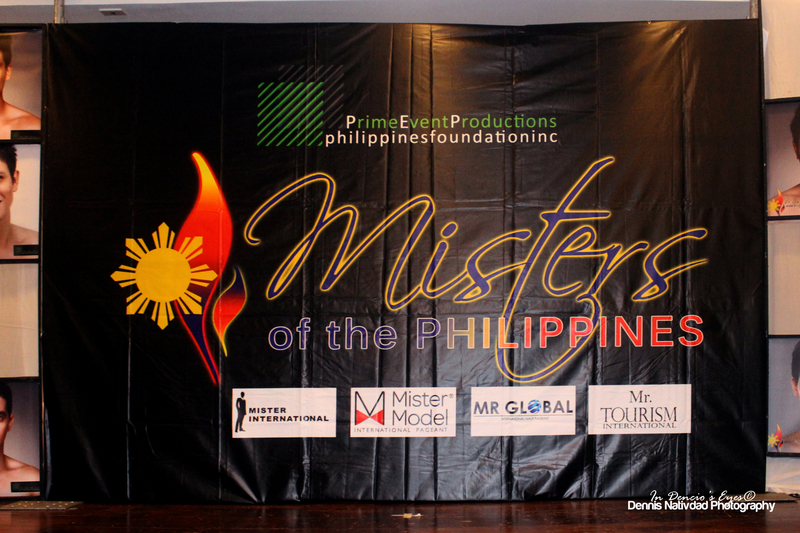 26 gorgeous men from all across the country and from international Filipino community were formally presented to the press and media as official candidates of Misters of the Philippines 2014 in a Press Presentation held at the Lancaster Hotel Manila, the official residence of the pageant. The candidates, who hail from different backgrounds—nurses, models, a Social Studies teacher, even a side-car driver and a police officer—all came to compete in the most prestigious male pageant in the country today in hopes of bagging one of four titles at stake and bring honor to the country. The official candidates have already started making a name for them even as the finals night is still on its way. They have already graced different media outfits whether in NCR or from the other regions. “We are truly proud of our candidates. We are happy how the public has been receiving them even days and weeks before today’s press presentation,” Galang further added. 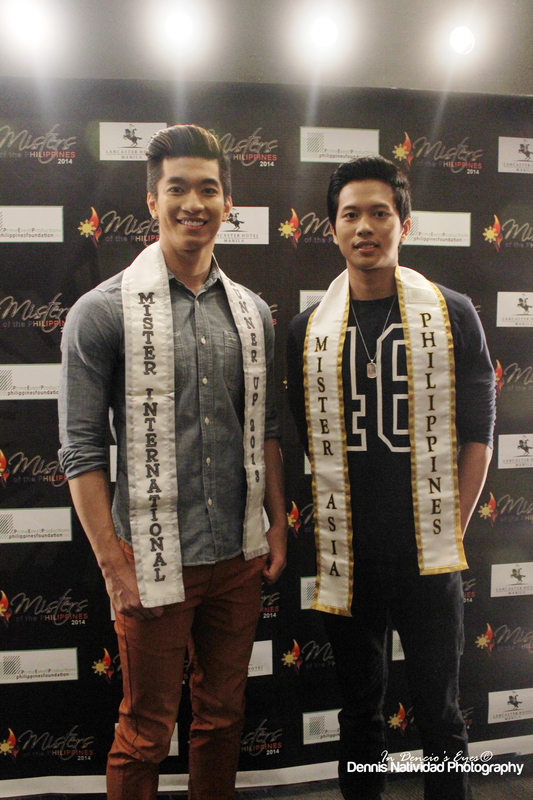 In attendance during the Press Presentation were Mister International Philippines 2013 Gil Wagas Jr. and Mister Asia Philippines 2014 Christian Mark Galang. The candidates of Misters of the Philippines 2014 will be competing for 4 major titles—Mister Global Philippines, Mister Tourism International Philippines, Mister Model International Philippines, and Mister International Philippines. The reigning titleholders have done a good job in representing the country in their international competitions. Erwin Mateo Trinidad was part of the Top 9 finalists at Mister Tourism International 2014 in Panama. He even won Best in Fashion Style. 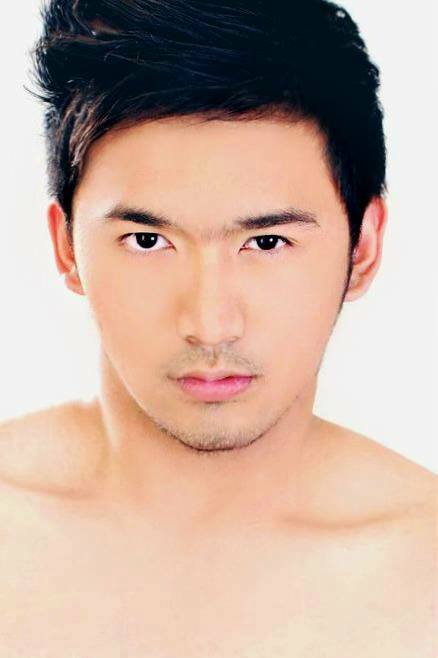 Wilfred Placencia Jr., on the other hand, placed 4th Runner-up at Mister Global 2014 held in Bangkok, Thailand. Last year’s main winner Gil Wagas Jr. finished with a 4th Runner-up placement at the 2013 Mister International Pageant in Jakarta, Indonesia. 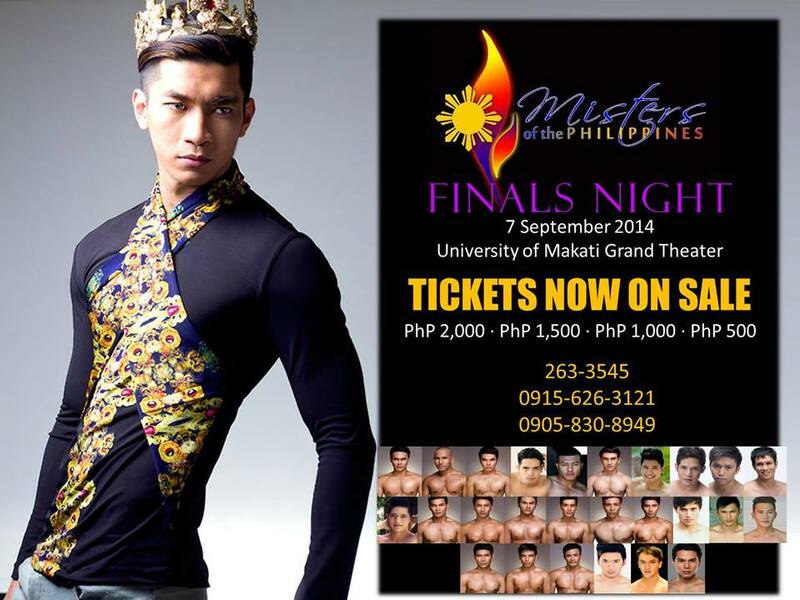 The 2014 Misters of the Philippines finals will be held on September 7 at the Grand Theater of the University of Makati. The pageant is presented by Prime Event Productions Philippines Foundation Inc. with Major Sponsors—Lancaster Hotel Manila, Official Residence; Shots Mobile Bar, Official Mobile beverage provider; TPC Events Concept and Design, Official event stylist and production designer; Jhune Salud, Official event coordinator; Crossfit Halcyon, Official Gym Partner; Fisher Mall, Official Mall partner; Informatics, Official tabulator; Zed, Official Text Vote Technology partner; Urban Smiles, Official dental care provider; Fernwood Gardens, official venue for the Gala Night; K-Pub Meat All You Want, official Presentation Show venue; Folded and Hung; Above Aesthetics; Arielle Agasang; Club Balai Isabel, official Resort Partner; Emerson Royce Urbano; Envy Me Salon; Freshman Hygiene for Men; Mobes Event and Entertainment; Multidestination Travel Agency, Natural Art Flowers and Decors Shop; Spectra International Insurance; Weddings and Beyond; BNS Photography; Casa De Imahe; CD Worx; Click N’Print; MC Studio, Nice Print Photography; Ross Paris Photography; I-Tech Digital. *Text from The Official Press Release of PEPPS Foundationa Inc.
View the complete set photos of the Misters of the Philippines 2014 Press Presentation here. 8 – COMPOSTELA VALLEY – Mario Esquierdo Jr.
16 – SAMAR – Edviro Fuentes Jr.
Que-kiam by Dennis Natividad · 365 Project. Que-Kiam is popular Chinese dish adopted into Filipino cuisine know as Kikiam. I tis a mixture of ground pork and vegetables rolled in thin bean curd wrapper (tapwe) that is deep fried and served with sweet-sour sauce. Misters of the Philippines 2014 by Dennis Natividad · 365 Project. The candidates, who hail from different backgrounds – nurses, models, teacher and even a side-car driver and police officer – all came to compete in the most prestigious male pageant in the country today in hopes of bagging one of four titles at stake and bring honor to the country. 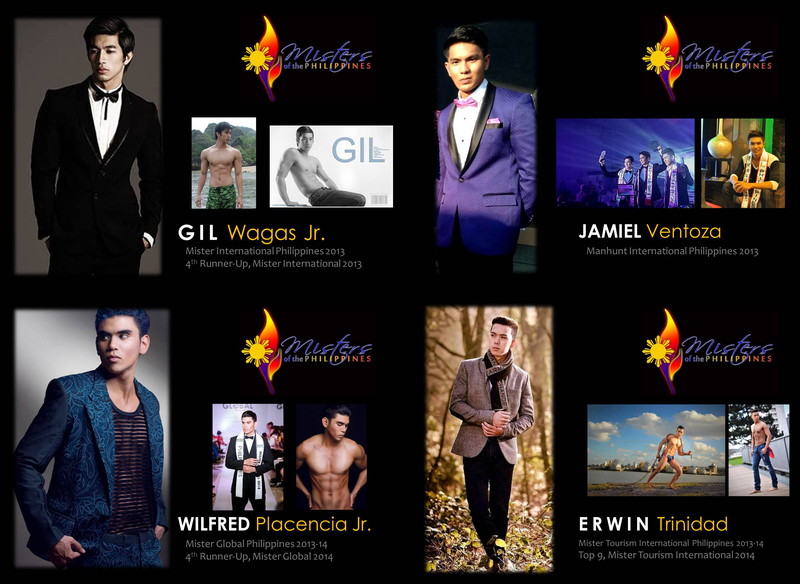 The candidates of the Misters of the Philippines 2014 be competing in 4 major titles – Mister Global Philippines, Mister Tourism International Philippines, Mister Model International Philippines and Mister International Philippines. Finals Night will be held on September 7 at the Grand Theater of the University of Makati. Church of San Agustin by Dennis Natividad · 365 Project. Oldest stone church in the Philippines. Plans were approved in 1586. Construction started in 1587 and completed in 1607 under the supervision successively of Augustinian Fathers Francisco de Bustos, Ildefonso Perez, Diego de Avila and Brother Alonso de Perea. Its architect was Juan Macias. It has withstood many earthquakes from 1645 up to the present and survived the British invasion in 1762, the Spanish-American War in 1898 and the Japanese invasion in 1942. The church choir has 68 carved Molave seats with Narra inlaids, an artistic lectern and parchment cantorals of the 17th and 18th centuries. The church and its graves were profaned during the British occupation of Manila in 1762. The ashes of early Spanish conquistadores Legazpi, Salcedo, Lavezares, and blessed Pedro de Zuniga and others now rest in the esternmost chapel of the transept. Terms for the American occupation of Manila were prepared in the vestry of the church in 1898. The First Philippine Plenary Council was held here in 1953. Chosen as a World Heritage Site by UNESCO in 1993. Pancit Misua by Dennis Natividad · 365 Project. Faith by Dennis Natividad · 365 Project. Sto. Niño de Tondo by Dennis Natividad · 365 Project. Sto. Niño de Tondo Parish Church by Dennis Natividad · 365 Project. The first Catholic minister of Tondo was the Augustinian priest Rev. Alfonso de Alvarado OSA. Tondo was the residence of Lakan Dula who was Rev. Martin de Rada. In the early days, its ecclesiastical jurisdiction extended up to Pasig, Cainta and Taytay. Tondo was the center of Catholic activities among the Chinese. The former convent was demolished in 1662 by Governer Sabiano Manrique de Lara as a military precaution against the expected attack on Manila by Kue-Sing. The present church was built by the Rev. Manuel Diez OSA and the Rev. Casimiro Herrero OSA in the second half of the 19th Century. Since the early days, the traditional fluvial procession of Sto. Niño has attracted thousands of visitors in Tondo. Bonete Bread by Dennis Natividad · 365 Project. Regina Coeli by Dennis Natividad · 365 Project. Imperfection is Beauty by Dennis Natividad · 365 Project. Beautiful Life by Dennis Natividad · 365 Project. Pinoy Pork Barbeque by Dennis Natividad · 365 Project. Tomorrow’s Realities by Dennis Natividad · 365 Project. Immaculate Conception Parish Church by Dennis Natividad · 365 Project. The town of Los Baños started as a visita of Bay under the Augustinian order with St. Nicolas de Tolentino as titular. In 1590, Franciscans replaced the Augustinians in their missions with Fray Pedro Bautista, later canonized as San Pedro Bautista. He discovered numerous hot springs in the area which locals called Maynit. He created a public bath he called the “Los Baños” After twenty years, the Franciscans established a temporary convent to administer the hot springs that were popular for healing illnesses. A small hospital chapel was built in 1613 in the absence of a church until 1727.Under the supervision of gobernadorcillo Don Juan Castañeda, a church in honor of Nuestra Señora de Immaculada Concepcion was built in 1671. 32 by Dennis Natividad · 365 Project. The Real Thing by Dennis Natividad · 365 Project. Everlasting by Dennis Natividad · 365 Project. What You Think About by Dennis Natividad · 365 Project. Green Apples by Dennis Natividad · 365 Project. Broccoli Juice by Dennis Natividad · 365 Project. Quiapo Church by Dennis Natividad · 365 Project. Free by Dennis Natividad · 365 Project. Fall by Dennis Natividad · 365 Project. Reflection by Dennis Natividad · 365 Project. Falling In Love by Dennis Natividad · 365 Project. Sun Will Shine by Dennis Natividad · 365 Project. St. John Mary Vianney by Dennis Natividad · 365 Project. St. John Mary Vianney, Patron of Priests. Hope by Dennis Natividad · 365 Project.